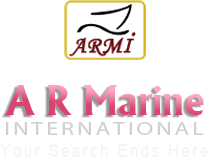 A R Marine International is a Bhavnagar (Gujarat) based Exporter and Supplier of Marine Machinery, Marine Equipments and Marine Spare, The company was founded in 2003, and is running very efficiently under the able guidance of Mr. Radhakrishnan Nair, who is specialized in Export Management and has an experience of 27 years in Marine Machinery field. The company has business points at Alang Ship Recycling Yard (Asiaâ��s largest ship recycling yard), located in Bhavnagar district of Gujarat. It has a team of highly experienced &talented professionals, who are well-versed with the latest trends of the domain. They carry out various business activities efficiently. In this way, we are able to meet the varied requirements of our honorable clients.